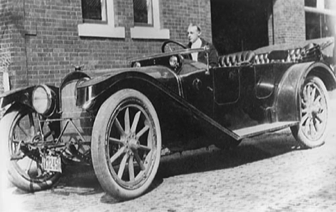 In the early 1900's, a low-riding luxury car was built in Martinsburg's Industrial center. The long and lavish Norwalk Underslung Six was billed as "The Car of Absolute Exclusiveness." It remains Martinsburg's primary claim to automobile history. It was also the most successful and longest made motor vehicle known to have been manufactured in the Mountain state. The auto manufacturer started in Norwalk, Ohio in 1910. After financial problems, a group of local investors brought the company and remaining parts and stock to Martinsburg. The company started assembling the car in 1912 in a building once occupied by the Brooklyn Brass Works located on Miller Avenue now known as Norwalk Avenue located along the Winchester & Western Railroad tracks in Martinsburg's once thriving woolen mill district . The company did business at this location through the late teens and then moved to New England, eventually folding due to economic times. The company manufactured trucks on the same assembly line as the cars, using some of the same parts; so, you can understand that this is a BIG car. In fact, the first motorized fire engine put into service with the Martinsburg Fire Department was built on a Norwalk Chassis.